A Wellness Policy is an integrated school, parent, and community approach for enhancing the health and well-being of students. School health advisory councils, coalitions, and broadly based constituencies for school health help build support for school health program efforts. Schools actively solicit parent involvement and engage community resources and services to respond more effectively to the health-related needs of students. 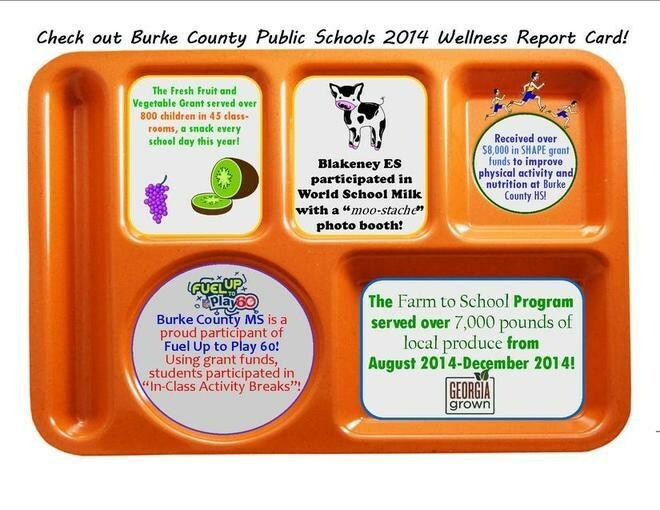 Want to be involved in helping develop the School System’s Wellness Policy? Well we would welcome your help! You can either, contact your school and ask to speak to a member of the Wellness Committee, or you can contact the Wellness Dietitian at the District Level (Kara LeClair-- kleclair@burke.k12.ga.us). Then ask them if you can be a part of the process in developing the local school wellness policy!